Destruction in Toronto’s Annex neighbourhood, December 23rd, 2013. Photo credit: Dagomar Degroot. In Toronto, 2013 was a year of storms. The media storm kindled by the mayor’s chicanery was twice interrupted by meteorological storms that threatened lives and property on an unprecedented scale. On July 8th more than 100 mm of rain inundated the city in a matter of hours, triggering flash floods that caused more than $1 billion in property damage. 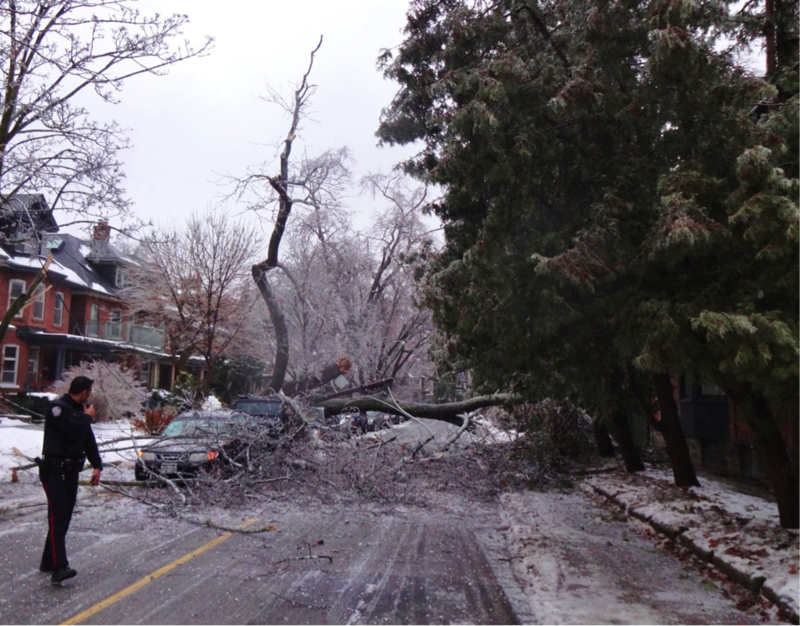 Three days before Christmas, winter storm Gemini unleashed more freezing rain than was ever recorded in Toronto. Some 300,000 customers – representing perhaps one million people – lost power as temperatures plummeted below -10° C. This time the city’s infrastructure succumbed to the force of frozen water, and those desperate for heat too often turned to candles, generators, and other sources of deadly carbon monoxide. 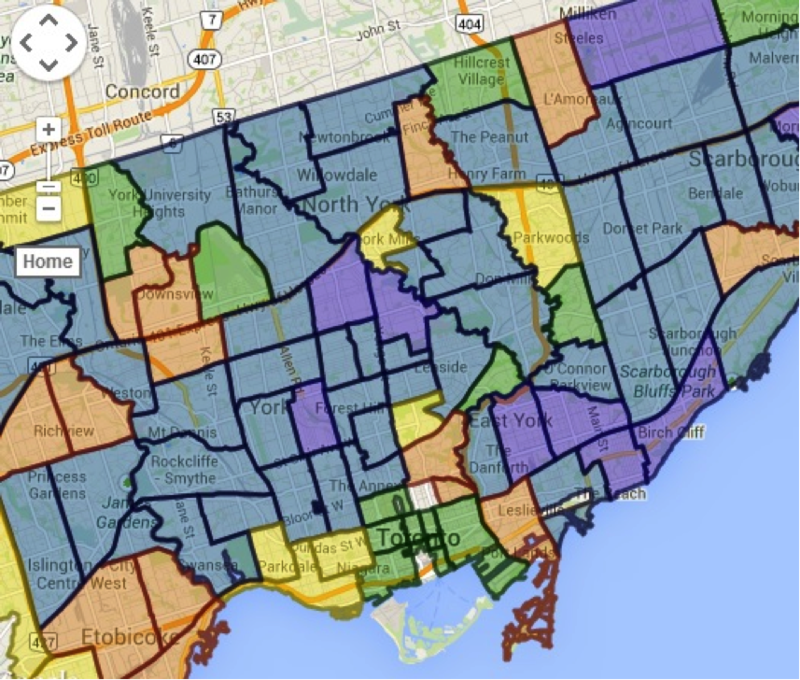 I am climate historian living in Toronto. Experiencing these storms helped me better understand how climate change, weather and society influence each other in the past, present, and future. Far more alarming was the morning of December 23rd. Once again I ventured from my apartment in the final hours of a storm, this time to secure food, warmth, and electricity. A final drizzle of freezing rain added to a ubiquitous layer of ice that already seemed at least two centimeters thick. Above me, trees groaned and creaked under the weight, and power line after power line lay draped across the sidewalk. Suddenly, a colossal crash: I turned to see that a huge tree had fallen nearby. A policeman at another collapsed tree rushed to respond, and I awkwardly staggered in pursuit across the ice. When I approached I saw that a van and a jeep had been torn apart. The rest of my walk was much more cautious (see the picture above). 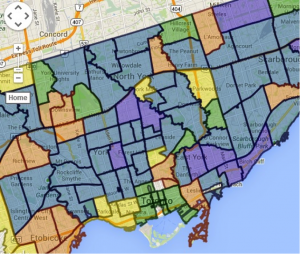 Toronto Hydro map of those without power, December 23rd, 2014. Thousands are powerless in purple and blue districts. Hopefully 2014 is politically and environmentally tranquil in Toronto. Still, it helps to be prepared. For historians, that means knowing that we can – and should – contribute to conversations about the most important issues of our time. Dagomar Degroot is a PhD candidate at York University. In 2010 he co-founded the Climate History Network and created HistoricalClimatology.com. There is a growing movement of people who think sentiments such as this are exactly the cause of the problem. Replacing natural systems which have had millions and millions of years of adapt resiliency against natural disasters with human systems that are cooked up based on grossly inadequate understandings of natural processes is a recipe for disaster. Our modern industrial way of living encourages efficiency at all costs. Efficiency is the opposite of resiliency and redundancy. Rather than trying to conquer nature with technology and systems, we should be trying to undo the damage we’ve already done to nature’s own resiliency and restore natural systems to as close to their original conditions as possible. Human technology will never achieve the efficiency and resilience of hundreds of millions of years of natural evolution, and after only three centuries of trying we’ve brought the entire planet to the brink of disaster. It’s time we admit that we’re addicted to technology and control and that our addictions are killing us and everything else around us.